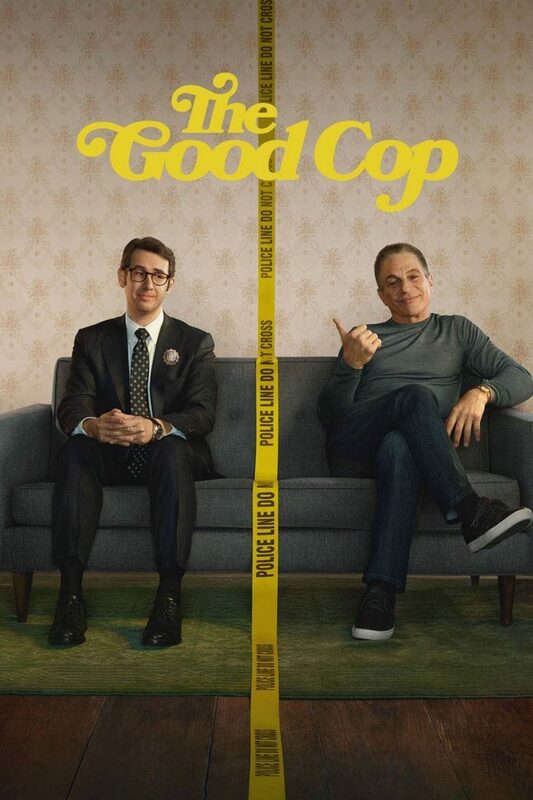 "Son’s on Patrol, Dad’s on Parole "
Netflix’s new TV show THE GOOD COP is the story of an unlikely pair, TJ Caruso, an obsessively honest lead investigator with the NYPD, and Tony Caruso, TJ’s father, a disgraced former officer just out of prison for being a dirty cop. The writing for Danza and Groban is somewhat uneven; some episodes are better than others. Mild violence, language, and sexual humor make THE GOOD COP inappropriate for children, while teenagers and adults will appreciate the show’s generally positive moral outlook. Television has a love affair with the police. Some of the best TV shows are about police officers. A huge range of genres exists – serious dramas like LAW AND ORDER are as popular as silly comedies like BROOKLYN NINE-NINE. In it first few episodes, Netflix’s new show THE GOOD COP is still discovering which end of the spectrum to embrace. The first episode felt serious, but each episode is more silly than the last. By the middle of the season, THE GOOD COP settled into being a charming, if slightly ridiculous, cop comedy. The show follows TJ Caruso (Josh Groban), an obsessively honest NYPD investigator. TJ’s pathological rule following creates some great comic moments, like when he won’t run through a broken red light. TJ lives with his father, Tony (Tony Danza), a disgraced former officer just out of prison for being dirty. Tony has a low moral standard, bending or breaking every rule to benefit himself. TJ and Tony’s differing personalities lead to some comic writing that feels part Neil Simon and part WHITE COLLAR. The show seems oddly tied to reintroducing these character traits every episode. Late into the season, they are still doing bits about TJ’s honesty – like in episode four when TJ finds a quarter on the ground asks everyone nearby if they dropped it before taking it to lost-and-found. Most episodes follow a similar pattern: TJ finds himself investigating a murder. Somehow (often in bizarre ways) TJ’s father, Tony, gets involved and complicates everything. The episodes often climax in Tony choosing between his own benefit or the greater good. This framework generally works well, but in order to give Tony new moral dilemmas each episode the writers end up making him look terrible. In episode 4, Tony tells a friend (who is helping him cheat at bowling), “Don’t worry. It’s just your conscience. It’ll pass.” We wonder how Tony has any friends. Many people say he has a “big heart,’ but that big heart is yet to be seen. Even worse, we wonder how it’s possible Tony was ever a cop. In fact, many of the officers in the show force that question. Burl Loomis (Isiah Whitlock Jr.) is a lazy cop whose regular refrain is, “I don’t run.” He holds true to that, letting suspects get away if they run from him. At one point, he ignores an important lead because the Jets are playing. Even TJ causes that question. By the middle of the season, his character is so goofy and awkward, so oblivious to his father’s obvious schemes, viewers may well wonder how TJ is the lead investigator with the NYPD. Only Cora Vasquez (Monica Barbaro) is the kind of police officer we would want guarding our lives. In this way, THE GOOD COP is much like BROOKLYN NINE-NINE. The team is a ragtag group of people who are mostly comic characters, aimed only to make us laugh and could never be real police officers in the real world. This part of the show is funny if you’re willing to suspend your disbelief. Tony Danza is over-the-top as Tony Caruso, but by the middle of the season his expressive acting finally seems to fit the show’s tone. Josh Groban, by contrast, seems miscast as TJ Caruso. The later episodes are better for him, as the writers seem to have figured out Groban’s unique personality. Still, Groban’s odd humor and awkward handling of the show’s serious moments are the weakest part of every episode. THE GOOD COP holds a complicated, dueling worldview – mostly between Tony and everyone else. TJ and the rest of the gang hold a classic moral, redemptive outlook, choosing sacrifice and justice over personal profit (usually). They want to do the right thing, even when it’s hard. However, Tony often seems to choose himself over everyone else. In Episode 5, Tony won’t testify against an old prison buddy. . . until he’s offered a cushy penthouse apartment as a safehouse. In the end, Tony often chooses to do the right thing. Even when he doesn’t, his selfishness doesn’t profit him. Happily, THE GOOD COP contains some Christian content: TJ has a Bible near his bed, and Tony goes to confession. THE GOOD COP has some blood, gore and violence; it is a crime show, after all. In general, the violence is campy and fairly mild. Sadly, some characters use both Jesus and God’s name in vain regularly. There is also some sexual humor. So, caution to extreme caution is advised.